I've seen a couple of styles at KG I quite liked. Their prices are usually 'off budget', so if I'm ever going to buy, it has to be during a sale. Prices are typically £120 to £160, with some even higher (£400). They are often styles I and Mrs Freddy find attractive, so always get a visit if a shop is close. 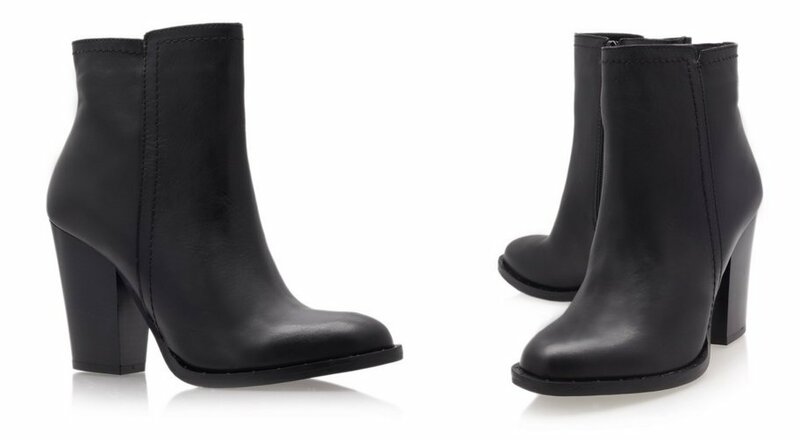 The sole, heel, and toe shape were first seen in some knee high boots. Loved them, but way way way over my budget. At the time, I thought how nice would this style be, if they were available in my favoured ankle boots style? And these arrived. At the KG store, they were marked at full price, so outside my interest there. Sadly. I had thought they'd already gone on sale, and checking at home, found they are now available for as little as £40/£50 at some on-line stores. 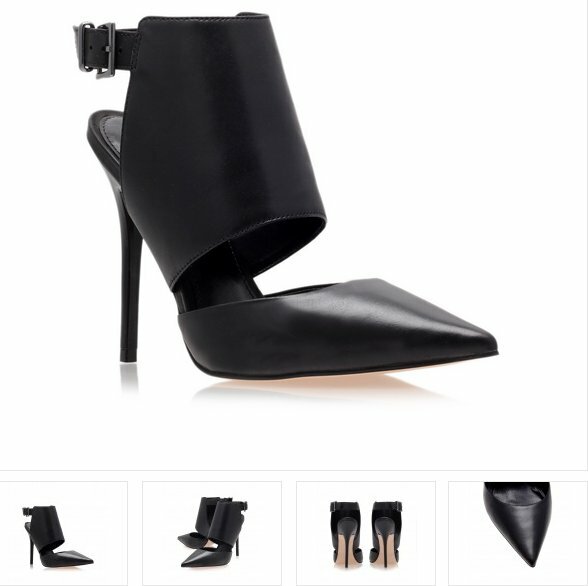 Reduced to £59, and I have a 'thing' for a high patent stiletto! So I spotted these two pairs, checked the prices, had a look at them. Two fellas serving in the shop, and the shop is just about empty. I did another circuit, and decided that despite there being two 20 something year old men in the store, I couldn't not try them. Grabbed the two pairs, and sat down. Tried on the shoe, stood up, and walked a couple of paces. I noticed one of the servers must have moved out the back, and the second was slowly moving around the front of the shop. The shoe was a bit tight, but that might be due to the gel toe protector helping to fill up the toe box. Then I tried on the Sindy boot, which I'd found out minutes before was a slip on style, with an ankle belt only for appearance. Inside the toe box was heavily padded, and I could (maybe) see why the boot was so expensive. These would be worn by most for hours without too much discomfort. While trying this one on, I noticed the other server had returned. Neither one approached me, though both were close enough for me to gather some attention if I spoke. Neither gave me 'dirty' looks nor spoke to each other while staring at me. Also, it would have been obvious what I was doing, not least because the server moving around the front of the store would have seen the shoes I was trying, and the heeled boots I'd arrived in. No problem. I left without buying, thinking I might return later if I had talked myself into a purchase. As the evening wore on, lack of time prevented me returning for the purchase, pep-talk. All three style are attractive. The wedges are higher than the KG site claim. The Jessica is over 5" high, though it has a small platform. The patent stiletto's ..... what's not to like? Perfect shopping experience. Left alone, no attention paid to me at all. Three very nice pairs of shoes there Freddy, I particularly like the look of the ankle boots, though the wedges would do me equally well.... If I had seen these and they had my size I would have left with £49 less in my pocket. The stilettos also look really nice, theres something about KG heels which look really classy and elegant! I am assuming that you were in the KG store in the village, so I would imagine the sales chaps are on commission, and would not give a damn about you trying on heels! It is always nice when the sales staff give you plenty of space when trying on a nice pair of heels! I can see you going back for one of those pairs Freddy! All three pairs are nice. I would like to try a higher wedge heel at some point. Mine are about 4" max. I'm worried you might be right. Let us know when you have indulged in a pair! Over the weekend it was close with the Coco court stilettos. The coco's hmmmm nice bedroom slippers in fact very nice but the will I get the full use of them question comes up! I think we shall soon have a story of you in the Jessicas! Ohh and yes I think that heel on the Jessicas would be fine for public wear, remember that pair of Ninewest boots I bought on our first meeting..... They had a slightly thicker heel but just as high AND I got away with wearing them in public! I have a couple of similar styles already, and that might be why I'm drawn to them. The courts; well, I just love a shiny stiletto, regardless to whether I could wear it outside. I don't know how you resisted buying them this long. Nearly £300's worth (at sale prices) and I've worn one pair (of Menzies), twice. So you're quitting buying shoes on a whim Freddy? When Nobody starts paying for them, he can have an opinion. Of all the styles, the courts are the ones I really really like. Really like. 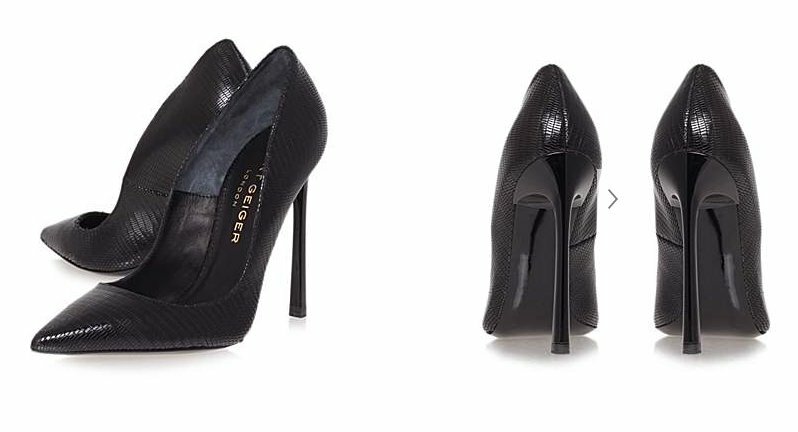 I know where I can get the other two styles for £40, but the courts are still £59. Not bad considering a similar style from KG (Eden) consistently sell for £150. So the Coco's are a bargain, and a lot higher than they might look. (ie almost 5 inches). But it's the same 'old story'. Where would I wear them? Been busy for a while so little time for writing, but I have been doing heel related stuff. As noted elsewhere, I did finally succumbed to buying the Coco stiletto court for £30 from John Lewis [90 day returns] on the day I'd met another male high heeler. Fitted well, looked lovely, but as expected - where to wear them? Plus I have another pair just like them, that I also haven't worn. Conclusion, sold them on. Ordered the Jessica from an online outlet, think they were £35 delivered? A bit tight on the right foot, so they went back. Lovely boot, even lovelier heel, but not comfortable enough to wear while walking. I resisted the Sindy even though they were available for £49. REALLY comfortable boot, but at the time, £49 was a lot of money and I was short of it. Have had a couple or three shopping experiences with KG since. 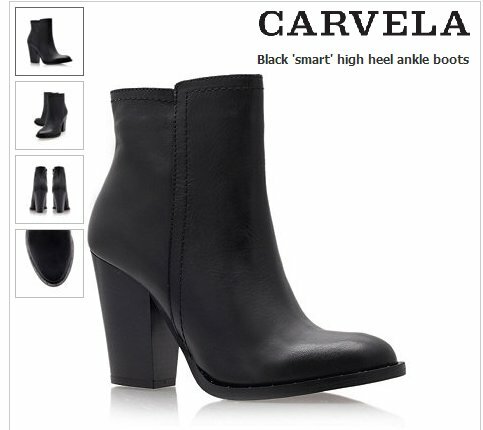 I'd spotted KG/Carvela included an ankle boot in their range about a year ago for around £150, that I had waited to see reduced sometime in a sale. Never happened, they just disappeared. They had a moderate 4" heel with fairly rounded toebox that might pass as mens shoes should I (or anyone) choose to wear them amongst people we know well. 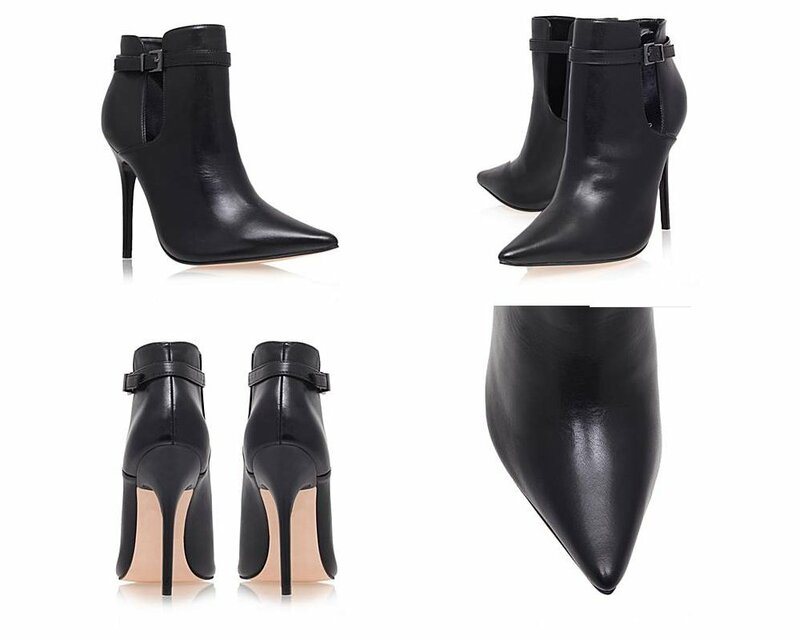 The success of the Acne ankle boot has spurred many to produce their version, and I doubt there has ever been so much choice for a block heeled ankle boot. This included several from the KG/Carvela house. One I'd seen and liked, was the "Smart". As the previous pair I'd been interested in, these were originally priced at £150. When they went to £89, I was more interested. With hindsight I should have shopped around to find these in a large store, where returns were possible if I wanted them to go back, but history (wrongly) suggested these might disappear quickly. I popped in to the KG store at Brent Cross without enough time to try them on, and was told their sale items came with a 7 day exchange-no refund policy. I declined to take them. A couple of days later I was back at the same store, with more time to try them on. During the second visit that week, the store was busy, and possibly the busiest I'd ever seen it. [sales?] I told one of the girls behind the counter they shoes were for me, and I wanted to try the right shoe on, as discreetly as possible. She was exceptionally helpful, and not only handed me the shoe out of sight of everyone else, but kept my purchase as quick and discreet as possible. [Meaning, the shoe was re-boxed out of sight and I was taken to the front of the short queue for the transaction.] As you will realise, the shoe fitted, and I bought the pair. It was a very easy and pleasant experience. I'd also spotted (in my quest to get a high heeled court shoe in leather) the KG Cilla reduced from £240 to £85. They were/are a nod to Louboutin 120 Pigalles in what I think they describe as snakeskin? I had tried to get to their Covent Garden flagship store to try them, but arrived just after they shut, having spent 15 minutes trying to find the store. Not deterred, I ordered them directly from the shop on the phone. It cost £4-95 to have them sent, which was cheaper than a further trip, and also allowed me to return them if I wanted. Although expensive, once I saw them and tried them on, I knew they were never going back. Like Loubies they are cut low around the toes which isn't great, but they are not shopping shoes anyway. At 5¼ inches, the heel is for standing in, not much else. Having missed the chance of a visit to the KG shop at Covent Garden, I dragged Mrs Freddy there with me a couple of weeks later. There was another KG style I wanted to try, but am unlikely to buy, certainly at the original retail price anyway. It's their Get boot. 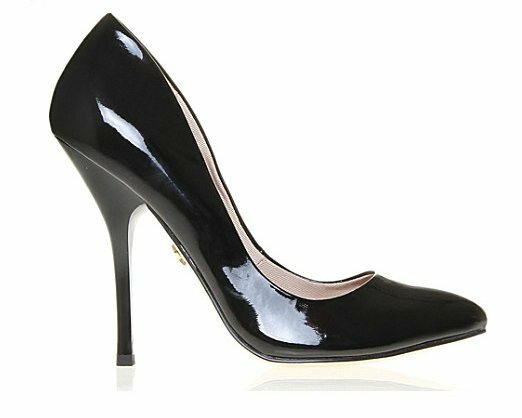 These are the closest I have come to finding a black court shoe in leather, with a higher/slimmer heel. Again these are not shopping shoes, but maybe a cinema/restaurant style. On arriving at the KG shop -in a heel- I had to wait until the doorman/doorwoman moved away from their guard position. Most of the range are in the basement down a large mirrored open stairway, and you certainly feel like you are making an entrance. Once downstairs, I initially got Mrs Freddy to try on some similar styles including the Get boot. None fitted (too narrow) but one did, the Carvela/KG Gain. For some reason, this particular style came up wide enough for Mrs Freddy's toes to spread comfortably. Not that she could walk in them. (Waaaay too high. ) Since I'd had her trying 3 or 4 different styles with no purchase at the end of it, I was already reluctant to ask the assistant to try the Get style for myself, especially since I knew I wouldn't be buying. At that time, I also noticed the lady from a couple on the next couch, had spotted my footwear. (I had not been discreet - at all.) It looked like she was trying to get a good look at my shoes to confirm her suspicions. I did catch a glimpse of the couple outside the store, minutes later. She was wearing very high heels, and maybe went some way to explain why she was 'switched on' to mine? The store staff seemed helpful, and I'm looking forward to returning during a sale period.